Whether you need to get an airliner across a continent without flying it, piggyback a space shuttle to its launch site, or ship Snoop Dog's oversized tour stage to Nigeria, you're going to need the world's biggest and strongest aircraft: the Antonov An-225. The Antonov An-225 Mriya is, quite simply, the largest airplane in the world. At 275 feet in length with a 290 foot wingspan and a maximum takeoff weight of 640 tons, it dwarfs 787's. When it debuted in 1988, the An-225 was 50 percent bigger than any airliner ever built before it. It remains the largest operational aircraft in terms of length and wingspan to this day. Designed at the end of the Cold War, the An-225 was built as a replacement for the Myasishchev VM-T to carry the Soviet Union's Buran space shuttle between launch and landing sites. The An-225 is based on the earlier An-124 "Ruslan", however it includes additional turbofan engines, a reinforced floor, and stronger, 32-wheel landing gear set than its predecessor. In all, the An-225 utilizes six Progress D-18 turbofans, each producing 51,600 lbf of thrust to haul its massive loads of cargo. This massive plane holds the world records airlifting a single-item payload—a gas power station generator weighing 418,834 pounds—and for airlifting a total payload of 559,577 pounds. The An-225 loads and unloads through its nose—the rear ramp and cargo door were removed to save weight—and actually kneels using its retractable nosegear, allowing deliveries to drive directly into the cargo bay and more easily position loads. The Mriya also differs from the earlier Ruslan in its tail assembly. The An-225 uses a split, twin tail—rather than the single vertical fin—that allows it to carry large external items up to 440,000 pounds. The first, and only, An-225 completed made its maiden flight in December 1988. A second Mriya was roughly 65 percent completed and plans had been laid for the construction of several more An-225s when the Soviet Union collapsed in 1991. 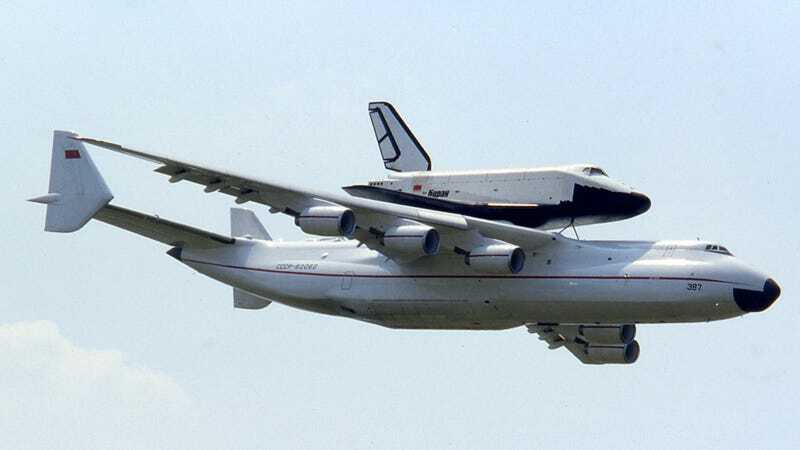 The Buran space program was cancelled, as were the contracts with Antonov, so the only 1.5 An-225s in existence were mothballed in 1994. After seven years under wraps, the full An-225 was pulled out of cold storage and refurbished for commercial use carrying oversized payloads long distances. There has been much discussion on finishing the second Mriya but it remains in storage until Antonov can find $300 million to complete the project. But given that the company has just restarted the production of its An-124s, the An-225 might not be that far behind.